You may have purchased a house with a partially finished basement project or you may have undertaken a basement finishing project yourself; assuming you could complete all the tasks by yourself. Whatever the scenario there are many basement finishing projects which are started and then left. They are normally disbanded for a genuine reason. At some point you will wish to take up where you left off and finish the project you started. This can be an undesirable thought but one that needs to be addressed. If you think you may have a basement finishing project it is advisable to speak with a professional to assess the possibilities and generate the best method of moving forward. Firms like Basement Finishing Company will be happy to provide a little advice for free. The first option you will probably consider is undertaking the majority, or even all, of the work yourself. This may be a viable option depending upon your current skill level and the amount of work which is required to finish the project. However, you should approach this option with caution; especially if you are completing a basement finishing project which was started b y someone else. You may not be familiar with where everything has been located and this can make the job extremely difficult. A basement also requires a wide range of skills as you will be faced with plumbing, heating, electrics, waste disposal and even checking the foundations. This is not a project you should take on lightly. The main alternative is to enlist the help of a professional firm. Any business which deals with basement finishing on a regular basis will be able to provide a competitive quote. You may even be surprised by how cost effective completing the basement is. This is the best option if you have little time spare. It is also beneficial if you have started the job but found too many areas that you are unable to finish to a high enough standard. 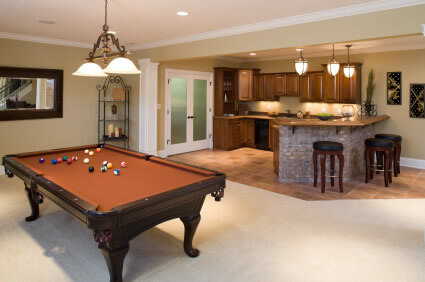 It is important to note that a basement finishing project completed to a high level will add value to your property. If it is completely to a generally acceptable standard it is less likely to increase the value of your property and may even put off buyers. When you consider the right basement finishing professional for your job it is important to look at their reputation. Someone who offers a quality service will have received a range of positive feedback and reviews. Alongside this it is worth looking at the experience each firm has. You should be able to attract a quote from three different professional firms and the costs should be comparable. If they are not each firm should be able to justify the difference. Social Media can play a valuable part in finding the right basement finishing firm as many people will post their opinions on these sites. You will need to look at the overall feeling more than just one or two posts.